03 November 1943: Keel laid by the Boston Navy Yard, Charlestown, Mass. 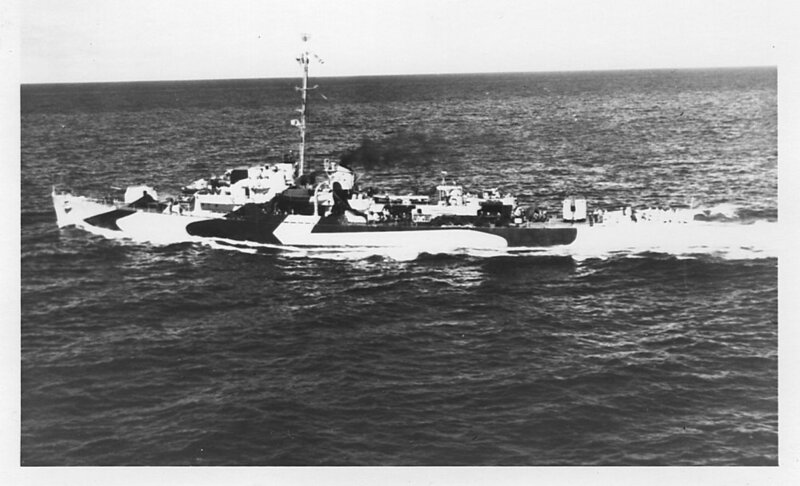 01 May 1946: Decommissioned at San Diego, Cal. 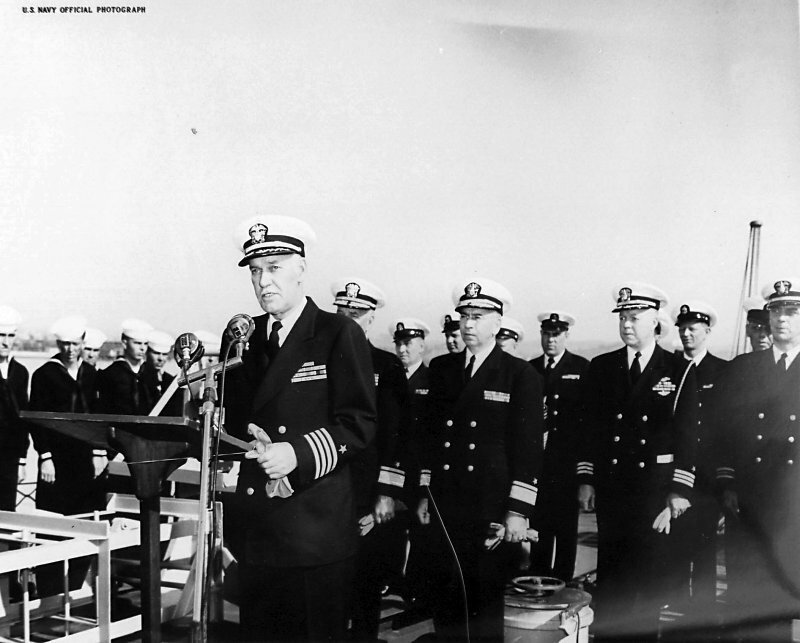 28 March 1952: Recommissioned at Mare Island Naval Shipyard, Lcdr Gordon S. Hawkins, USN, in command, assigned to CruDesPac at San Diego, Cal. operate in the deepest ocean waters), Lewis, using her depth finding gear discovered the deepest spot ever found in the ocean; 35,800 feet. 26k Victor Allen Lewis was born in Sommerville, Massachusetts to Mr. and Mrs. Murray Lewis of 245 Allen Street, Randolph, Massachusetts on 2 August 1919. He graduated from Stetson High School in Randolph, and attended Springfield College, where he was active in athletics, including varsity track and gymnastics. He also coached track, swimming, tennis, and gymnastics. He enlisted in the United States Navy Reserve as a Seaman second class at Squantum Naval Reserve Aviation Base, Boston, Massachusetts 17 February 1941. In April 1941, he was transferred to Naval Air Station, Jacksonville, Florida where he accepted an appointment as Aviation Cadet. 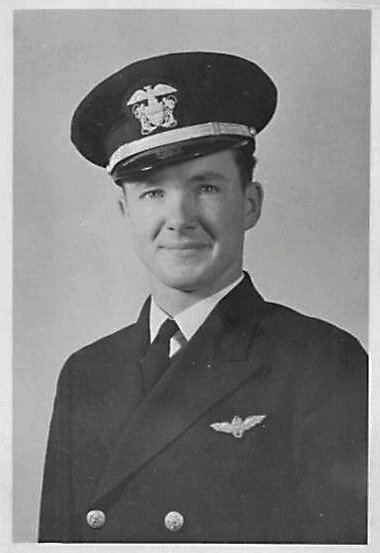 He did advanced flight training at Jacksonville and Miami and was designated Naval Aviator on 1 December 1941. He was promoted to Ensign with a date of rank of 14 October 1941. He was transferred to Naval Air Station, Norfolk, Virginia for further training with Advanced Carrier Training Group, Atlantic Fleet. In February 1942, he was assigned to Torpedo Squadron 8 aboard the USS Hornet in the Pacific area. Ensign Lewis was reported as missing in action on 4 June 1942 during the Battle of Midway. He was posthumously the Navy Cross and Purple Heart. 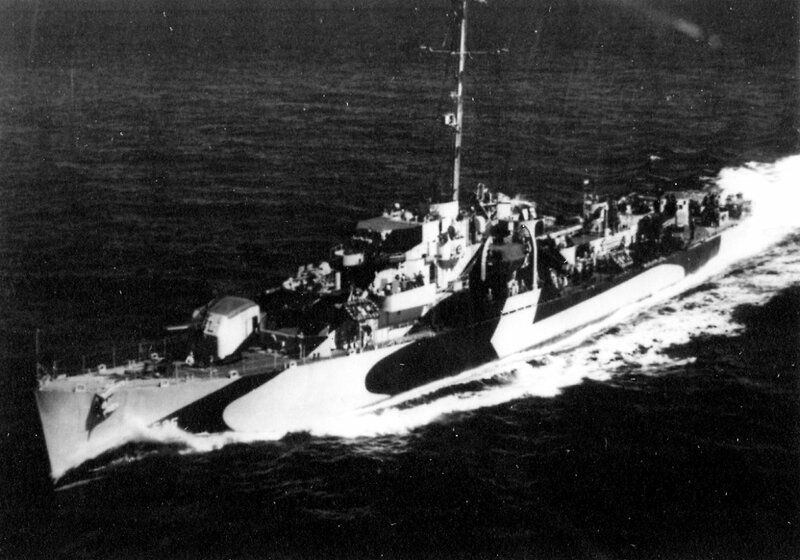 USS Lewis (DE 535) (1944-1946, 1952-1960) was the first ship to be named in his honor. 170k 16 September 1944: the Atlantic Ocean - USS Lewis (DE 535) off Boston, Mass. 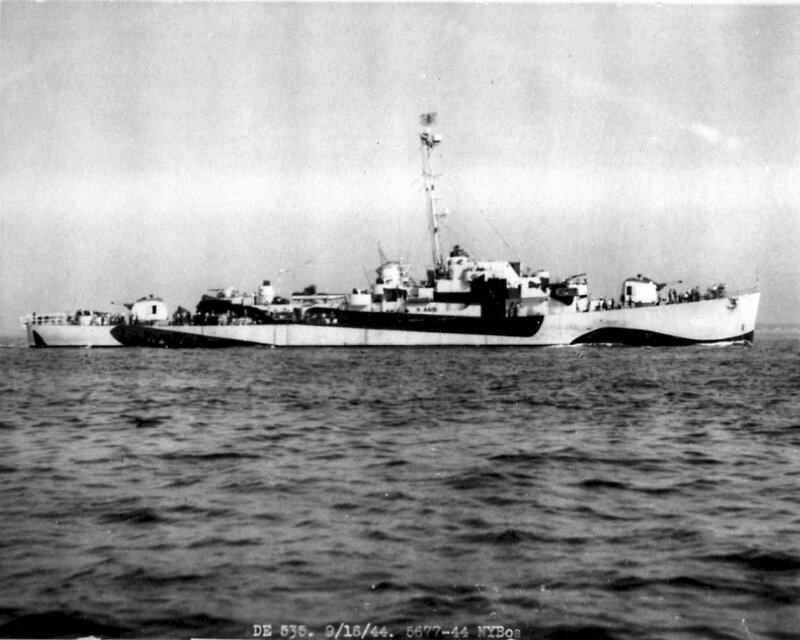 11 days after her commissioning. 198k 22 September 1944: the Atlantic Ocean - USS Lewis (DE 535) 60 miles east of Boston working out kinks in anticipation of her shakedown cruise to Bermuda. She''ll be leaving on 28 September to spend a month training her new crew. 109k 22 September 1944: the Atlantic Ocean - USS Lewis (DE 535) 60 miles east of Boston headed west, wearing camouflage measure 32/22d. 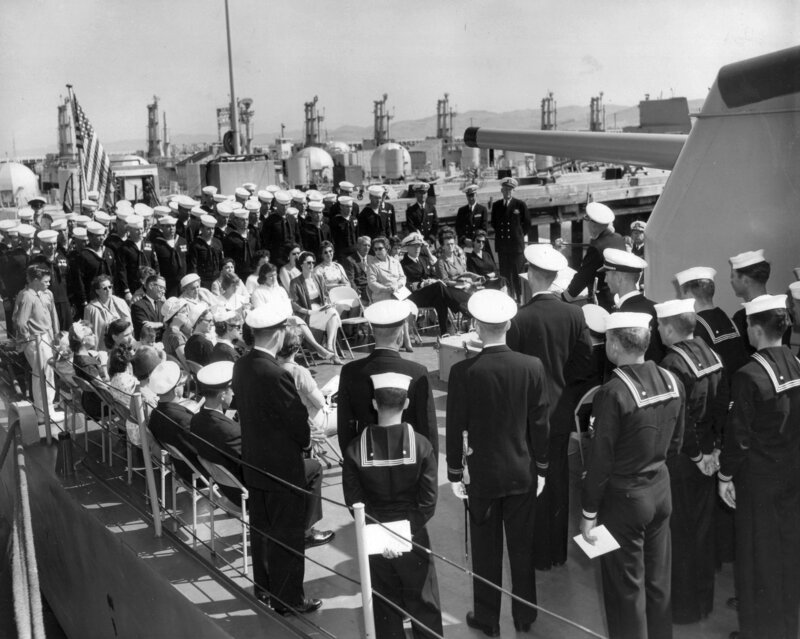 76k 28 March 1952: Mare Island NSY - Commissioning ceremonies aboard USS Lewis (DE 535) at Mare Island. She was in conversion status at the yard from 01 October 1951 to 09 May 1952. 301k 17 January 1956: Mare Island Naval Shipyard, Vallejo, Cal. - Four destroyer escorts are in dry dock #2 at Mare Island. 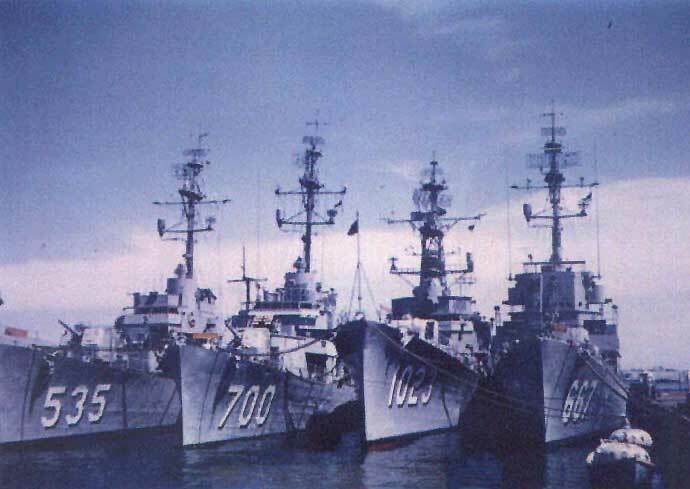 Back row are: USS Ulvert M. Moore (DE 442) left and USS William Seiverling (DE 441) right; front row are: USS Wiseman (DE 667) left and Lewis, on right. 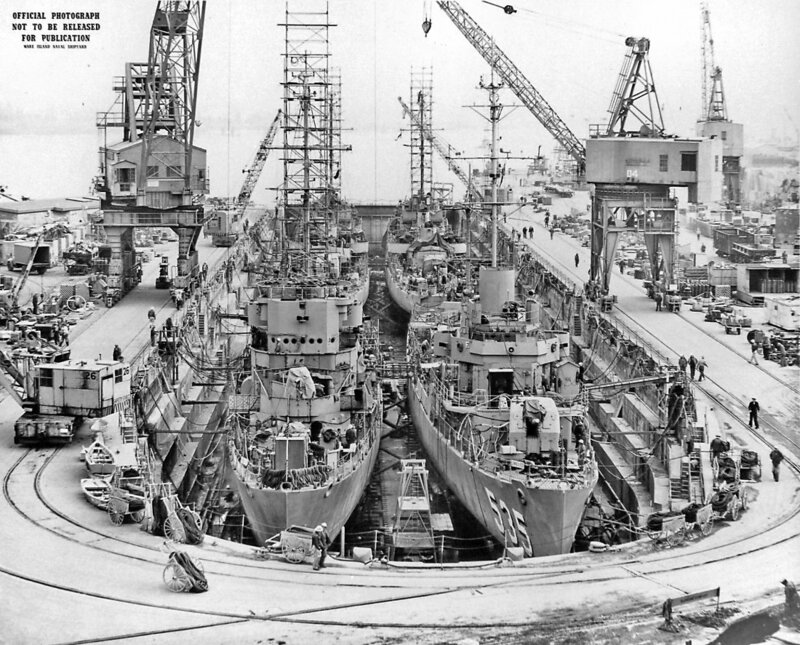 All were in dock from 15 December 1955 to 18 January 1956 and started overhaul on 28 November 1955. Wiseman completed overhaul on 29 February 1956, Seiverling & Moore completed on 11 February 1956 and Lewis completed on 09 March 1956. 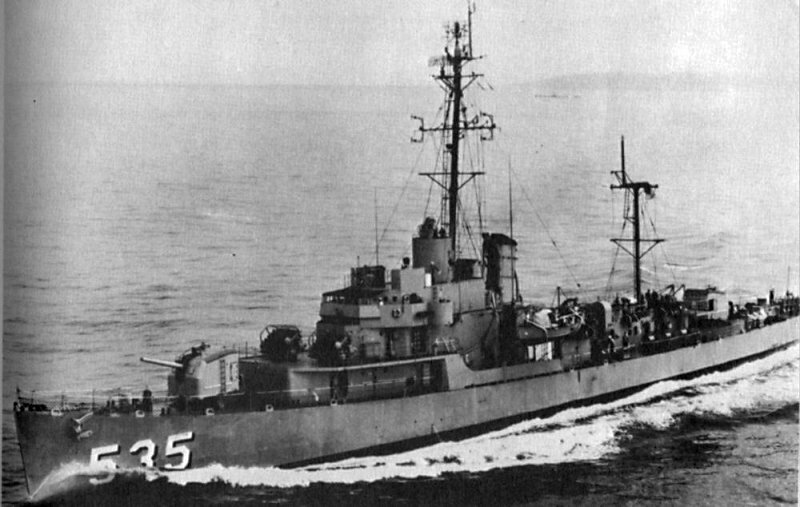 94k circa 1959: USS Lewis (DE 535) underway. 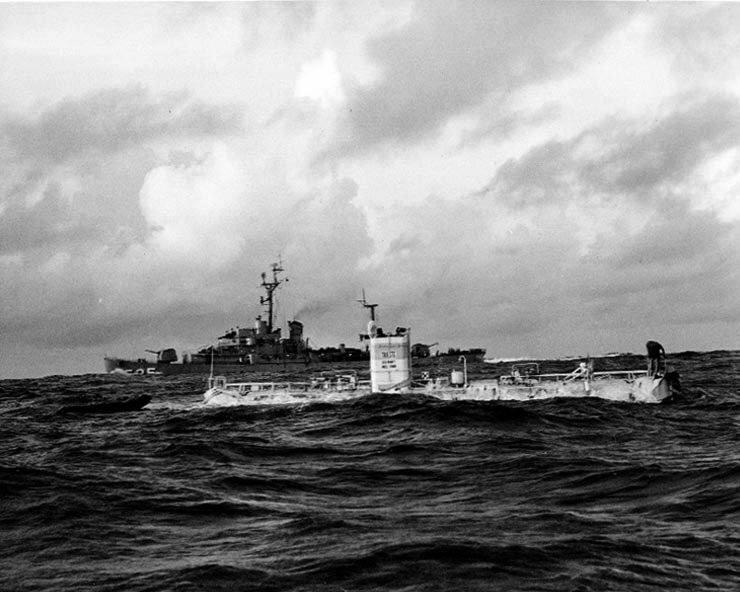 76k 23 January 1960: The Pacific Ocean - The U.S. Navy Bathyscaphe Trieste, just before her record dive to the bottom of the Mariana Trench. The dive, to a depth of 35,800 feet in the Challenger Deep, off Guam, was made with Lieutenant Don Walsh, USN, and Swiss scientist Jacques Piccard on board. Waves were about five to six feet high when the two men boarded Trieste from the rubber raft seen at left. USS Lewis (DE 535) is steaming by in the background. 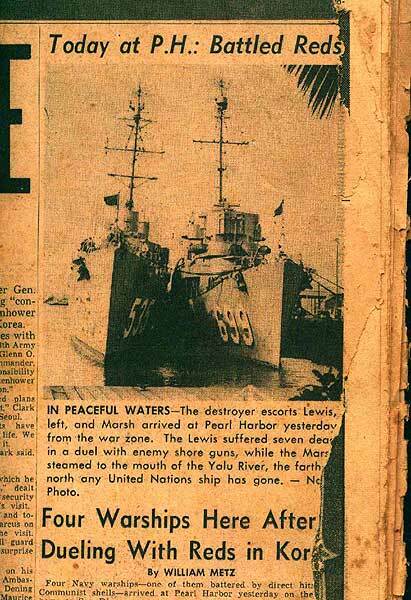 370k 27 May 1960: Vallejo, Cal. - Decommissioning ceremonies of the USS Lewis (DE 535) at Mare Island Naval Shipyard. Note all the decommissioned submarines in the background. 312k 27 May 1960: Vallejo, Cal. - Radm. 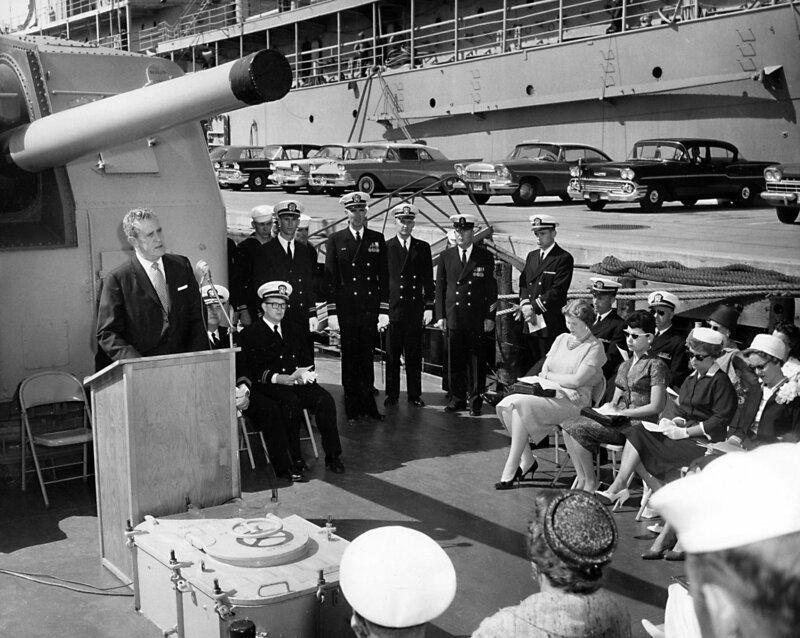 W. L. Erdman (Ret) speaks at during the decommissioning ceremonies of USS Lewis. 319k 27 May 1960: Vallejo, Cal. 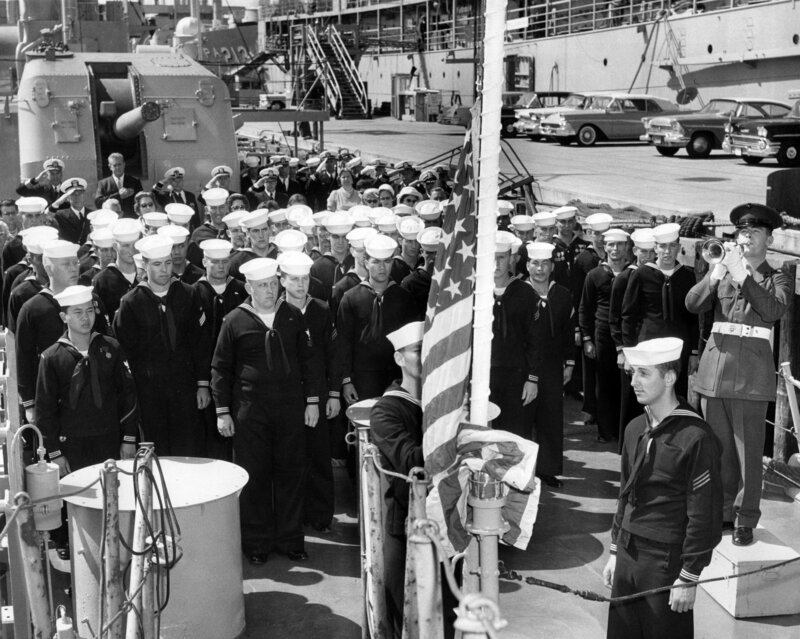 - The colors are lowered aboard Lewis during her decommissioning ceremonies at Mare Island. 107k 27 May 1960: Vallejo, Cal. - The official decommissioning party of the USS Lewis at Mare Island. 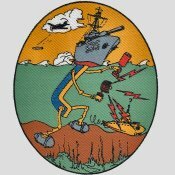 Left to right: Radm. L. V. Honsinger (Shipyard Commander), Radm. 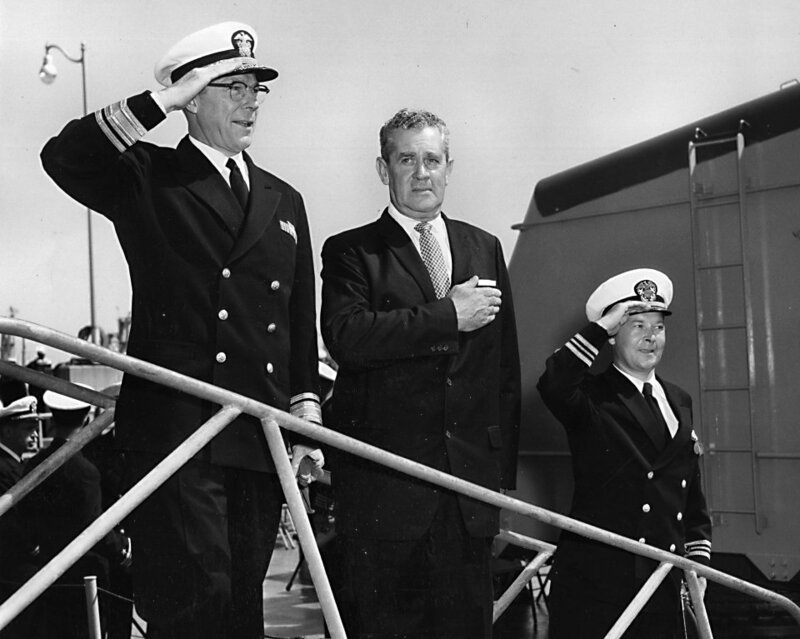 W. L. Erdman (Ret), and Lcdr D. L. Banks (Commanding Officer). 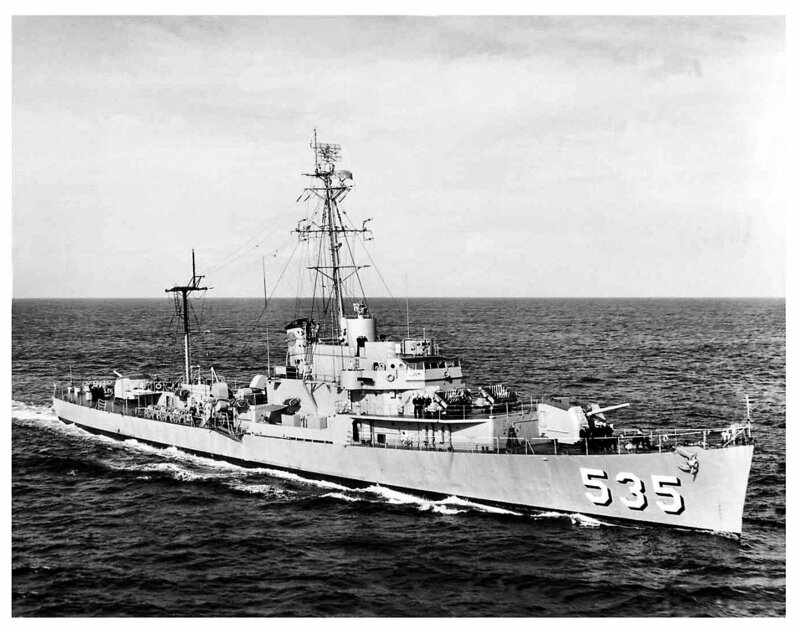 View the USS Lewis (DE 535) DANFS history entry located on the Naval History and Heritage Command web site. 7.) 09 Jul. 1953 - 04 Jul. 1955 Lcdr. Charles Clay Roberts, Jr.
7 - 11 September 2015 at Rapid City, S.D. Address: 1945 N. Riley Ave.